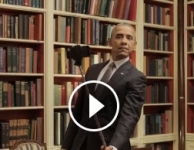 You have to see Obama's selfie video he did for Buzzfeed! Things Everyone Does But Doesn't Talk About. Its hilarious. Pres. Obama is the surprising new star of a BuzzFeed video where he makes goofy faces, doodles of Michelle Obama at work and yes, even takes a photo with a selfie stick.